Luxurious treats for total indulgence: 135 irresistible recipes shown in 260 stunning photographs. 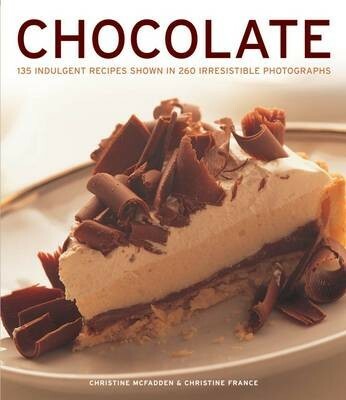 You can discover the wonderful world of chocolate with this fabulous cookbook of recipes from all over the world. It features a sensational range of luxurious treats, from classics such as Chocolate Profiteroles, Chocolate Truffles and Chocolate Pecan Torte, to Mississippi Mud Pie, Rocky Road Ice Cream and White Chocolate Macadamia Slices. Chapters include Small Bakes and Cakes; Large Cakes and Loaves; Hot Desserts; Cold and Frozen Desserts; Sweets and Drinks; and Chocolate Toppings and Decorations. It is a guide that shows you how to temper, melt, drizzle, pipe, marble, curl, scroll, coat, grate and decorate with chocolate. It is a fascinating guide to chocolate that explores its history and cultural significance, from the Mayans' first discovery of the cacao bean through to modern-day production. No other food comes close to chocolate for sheer indulgence, and this beautiful new book will show you how to choose it, melt it, cook with it and enjoy it. Each page will take you through the very best of chocolate cooking, with classic recipes from all over the world as well as deliciously new, innovative and contemporary ideas. You might want to start with Chocolate Profiteroles, Chocolate Lemon Tart or Chocolate Sorbet with Red Fruits. Or you could pick Chocolate Pecan Pie or Chocolate Hazelnut Galettes, or simply succumb to the infamous Death by Chocolate. Clear, concise step-by-step instructions will guarantee great results every time.